The extra-EU transfers should have the clause OUR. The amounts credited to us must match the Total Order. 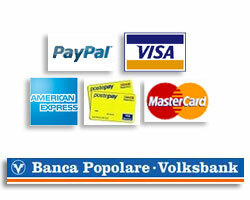 You can use credit cards such as Visa, Mastercard, American Express, PostePay. The payment will have the following modes: One Solution. Piarotto.com not display your data that are managed by Verisign secure servers of PayPal.